The Tokyo Game Show will kick off later this week, and MSI will be on hand to showcase its VR backpack called the VR One. 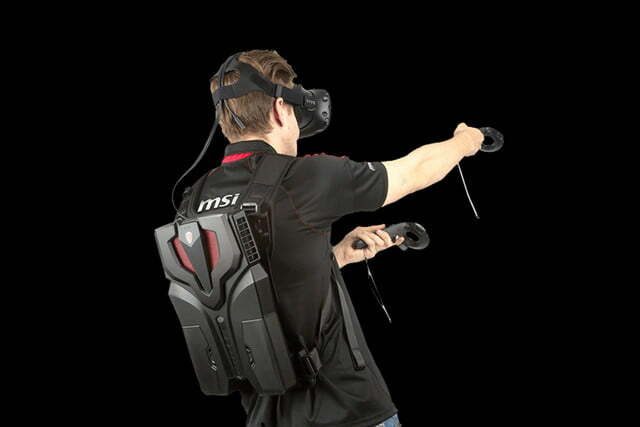 It’s a computer that can be worn like a backpack and optimized for the HTC Vive headset, allowing users to walk around freely in their virtual worlds without the leashed constraints of cables. Of course, cables are still involved, but with the VR One, the computer is no longer the anchor. But don’t get your hopes up of running around with a computer on your back all day. 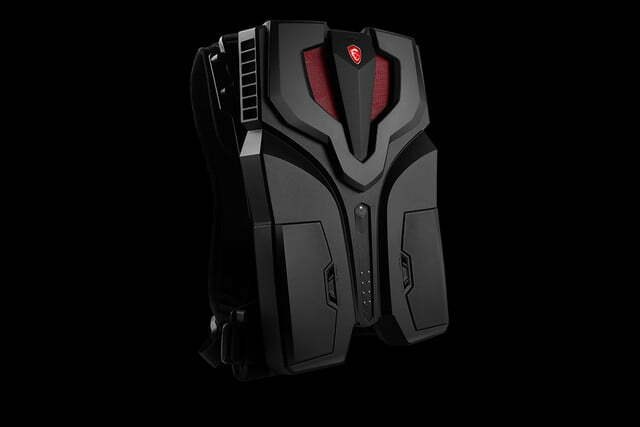 The VR One comes with two rechargeable, hot-swappable battery packs, one inserted on each side of the unit, that provides up to 90 minutes of pure VR gameplay combined. Granted, that’s not a lot of time, but keep in mind that this device doesn’t seem to be a strapped notebook, but rather a compact, high-end desktop that must power a VR headset and its controllers in the process. As for the system specs, MSI hasn’t exactly been forthcoming before the show, stating that it’s powered by an overclocked, high-end Intel Core i7 processor and a Nvidia GeForce GTX 1070 graphics chip. Device connectivity includes four USB 3.0 ports, one HDMI port, one Mini DisplayPort, one USB Type-C port supporting Thunderbolt 3, a microphone jack, and a headphone jack. It’s overall weight with the batteries intact is just under 8 pounds. 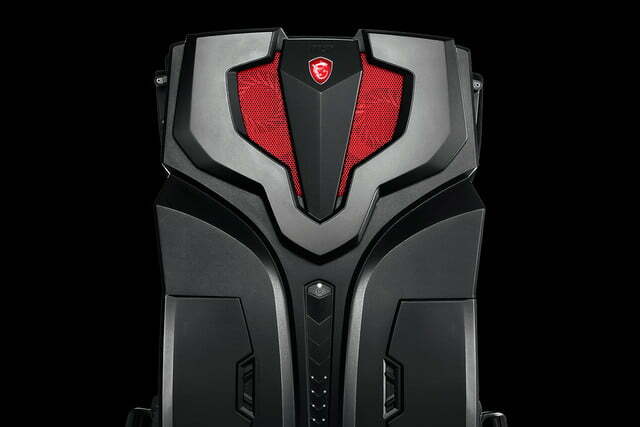 Because this is a PC users wear on their back, cooling is a priority given the heat generated between human and machine. The unit’s cooling system relies on two 90mm fans and nine heat pipes, producing less than 41dBA of noise. 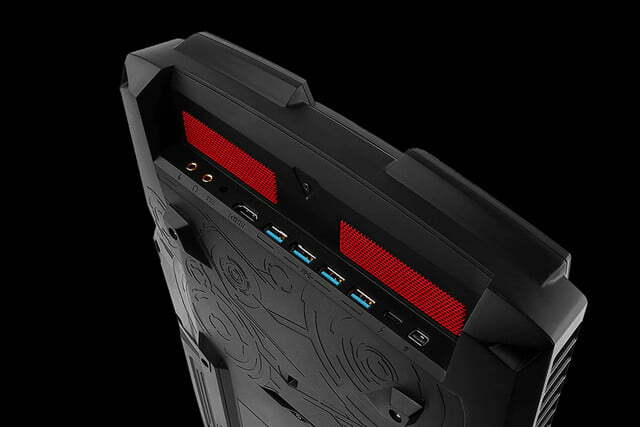 Again, MSI doesn’t provide any details just yet, but images show what appears to be two air intakes on the front, two air intakes on the back, and an air vent on each side of the device. On the battery front, the unit provides four white LEDs next to each of the battery mounts. When all four LEDs are illuminated, the associated battery is at 75 to 100 percent capacity. When there is only one LED lit, the battery is below 25 percent. This LED will blink when the battery is about to give out, and will require the user to plug in a power adapter to swap it out. In turn, this power adapter allows the unit to serve as an ultra-slim PC gaming desktop, not just a VR backpack. Of course, we’re not exactly sure how users will be able to see the battery status lights with a VR headset strapped to their face. 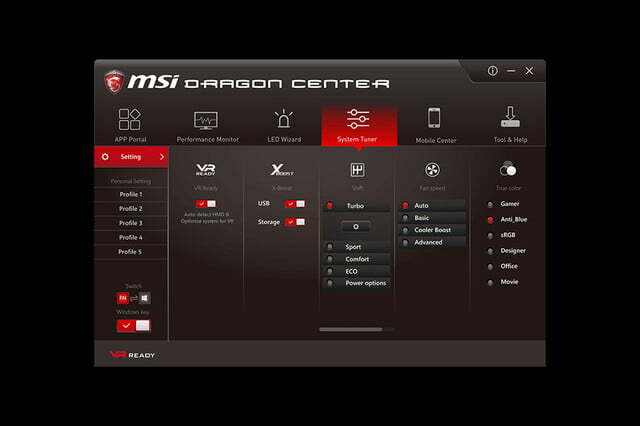 That’s likely where the MSI Dragon Center software comes in, which is accessible with a single click of a VR key. This platform includes a hardware performance monitor, a system tuner, an LED wizard, an app portal, and a mobile center, allowing users to make adjustments by way of a smartphone. MSI is expected to launch the VR One here in the United States sometime in October, and we expect to hear the hardware details later this week. That also goes for pricing, which wasn’t revealed in the company’s tease distributed on Monday. Expect to hear more sometime around Thursday.